Hire the photographer — This will help you to get your engagement photos, the photo you will use for your invitations and will also give you an idea if you like their services. Launch a wedding website – This will allow you to start putting information on-line in order to guests – and even members of the wedding – to know important information as well as travel information and eventually, on-line invitations if you choose to go that route. – you may want to view area hotels and reserve rooms for the evening of your wedding, if needed. Purchase your dress! – By this time, we are sure you have been trying on dresses all over the place! It is getting to be the time that you actually need to purchase your dress. You will probably need 2-3 fitting appointments as you go through this process. 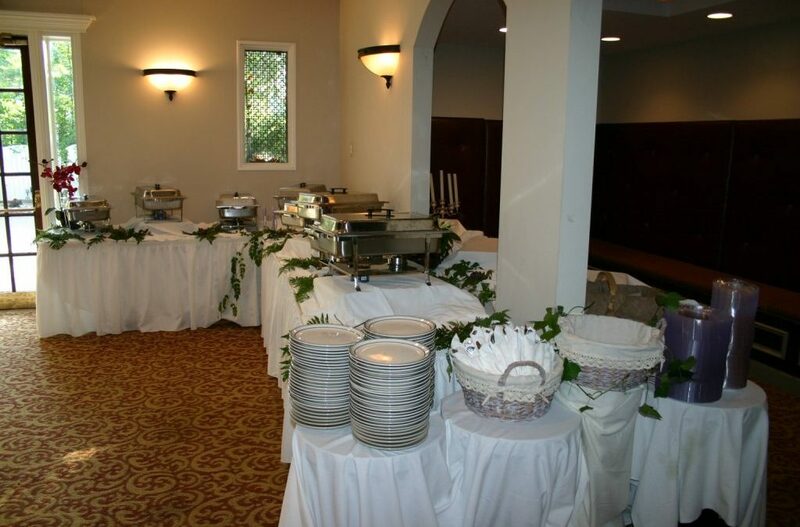 Meet caterers – At Gala Event Facility, we offer several choices of preferred caterers that you will be able to schedule tastings for in order to decide which one to use, what food meets your desired palate – or – we allow our guests to bring in their own caterer if they choose to do so. You really want to get your caterer hired during this time frame as their schedules book up. Book the Entertainment — Begin to finalize your idea of entertainment – only a DJ, a small band, actual entertainers and singers, etc…. these need to be booked as well during this time. Our Event Facility also offers several options of DJs and Entertainment. Book a florist – Florists have the ability to serve several clients/weddings on a single day; however, you need to finalize your colors, choice of flowers so the florist can begin to research if they are available during your wedding season, how much they will cost and how extensive your floral arrangements will be. Book your officiant – You would be surprised how quickly their schedules can fill up! Send save the date cards – This is not a must; however, many couples are choosing to do this so that their guests can have it already scheduled and planned for. Shop for bridesmaid’s dresses – Allow at least 6 months for the dresses to be ordered and sized. Start planning a honeymoon – Make sure that your passports are up-to-date and begin to research and book your stay so that you can either make payments or family can know how much to contribute. Purchase your invitations – Decide on your invitations, order them so that if there are any incorrect spellings, etc.. you will have time to address the issues. Plan for the budget to include mailing the invitations itself, but also return cards and extra postage if the invitation is a larger size. Remember that addressing the cards can be time-consuming so you may want to plan with your maid of honor/bridesmaids to assist you. This is the second blog to assist brides with their wedding timelines. You should be deciding and buying your wedding dress during this time as well as shopping for bridesmaids’ dresses. Also, getting your invitations, engagement pictures and save the date cards taken and sent out as well as booking your florist, entertainment and caterers. Gala Event Facility is nestled in a beautiful location that not only offers all inclusive, budget friendly wedding/event packages as well as a la carte options. Our Marietta wedding venue, also has an on-site wedding coordinator who is experienced and can help your wedding day flow effortlessly from choosing your colors and/or decorations to vendor choices and coordination of the actual ceremony! We pride ourselves on being a venue that has many return guests as they enjoy our event facility, the decorations, our preferred vendors, the quaint location, customer service and most of all, our budget friendly prices. Keep watching for our next blog on what to do four to five months prior to the wedding!